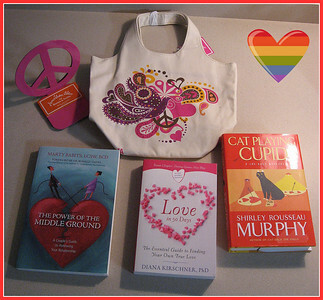 Welcome to Books R Us and the Valentine's Day Blog Hop. There are so many blogs participating in the Valentine's Day Blog Hop. You will find some nice book related items being given away. There is a linky at the end of this post. After you've entered here, hop on over to the next blog on the list and keep going as long as you'd like! The more you enter, the more likely you are to win. Good luck! I am giving away some lovely items perfect for Valentine's Day. A lovely tote bag by Johnathan Adler. Peace Book ends- To organize all of the books that you have. Love in 90 days by Diana Kirschner. Check out my review of the book. Cat Playing Cupid a novel by S. Murphy. The Power of the Middle Ground by M. Babits. 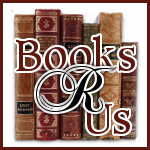 Follow Books R Us on Networked Blogs. Giveaway ends 2/16/2011 at 11:59 PM Eastern.